The Jane B. Eisner Middle School is the latest chapter in a success story for Camino Nuevo Charter Academy, a community-based association that has combined idealism and a firm grasp of practicalities in educating children in LA’s immigrant communities. Like Green Dot and other non-profits, it offers a free alternative to failing public schools. 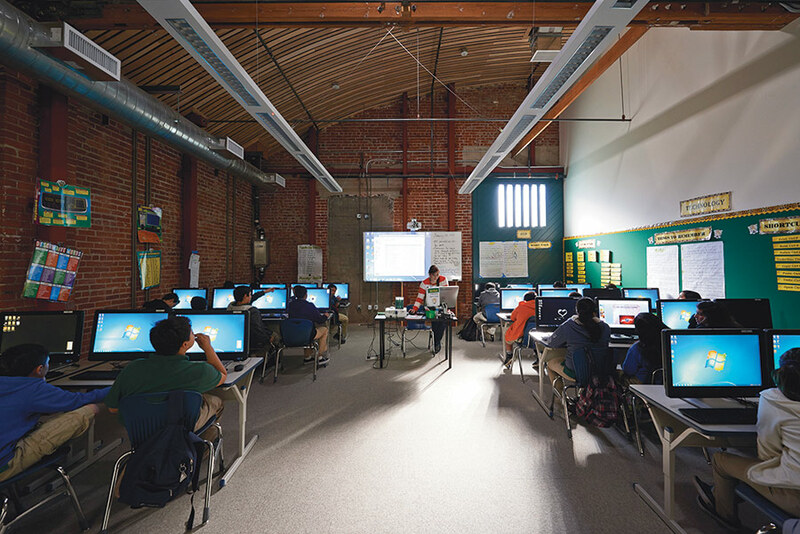 In 1999, Camino Nuevo hired Daly Genik Architects to create their first school from an empty mini mall in MacArthur Park, and the firm has extended the Burlington Campus three times since then. 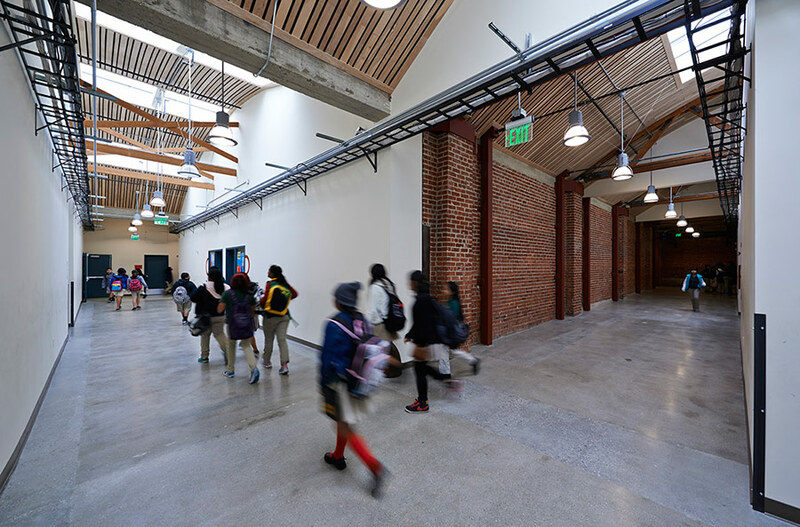 For their seventh school, Camino Nuevo selected Frederick Fisher and Partners (FFP), which had never before designed a school but offered experience in cost-efficient renovation. The school, named for the Jane Eisner Foundation, is located in Harvard Heights, a historic neighborhood just west of downtown. Exposed bow trusses (left). Circulation space at the new school is bright and airy (right). FFP is best known for its art spaces, most recently an addition to the Colby Museum in Maine, and college buildings from Otis to Princeton. But they got their start doing low-budget loft conversions for artists who anticipated the recent renaissance of downtown LA by thirty years. So they responded enthusiastically to the challenge of turning a 1920s PacBell service facility into a creative environment, as they had with the Bergamot Station tram depot. 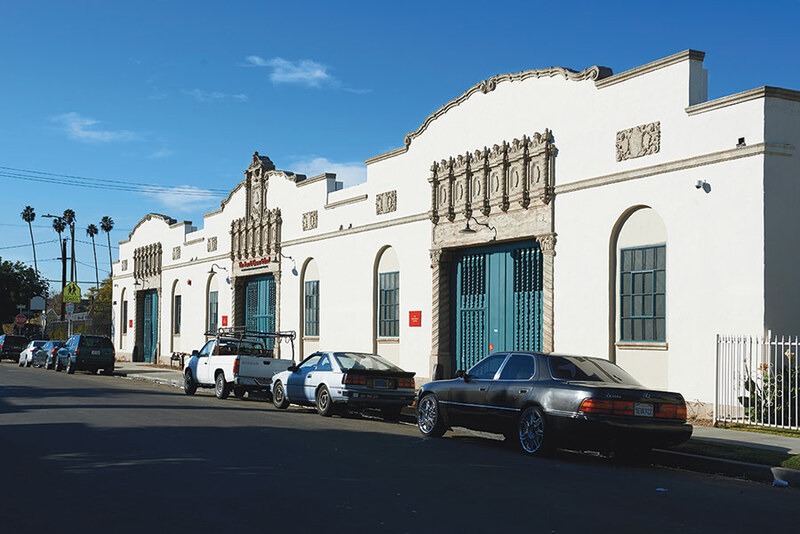 The building is an LA Historic-Cultural Monument and its windowless cement plaster walls and cast stone Churrigueresque portals were left untouched. 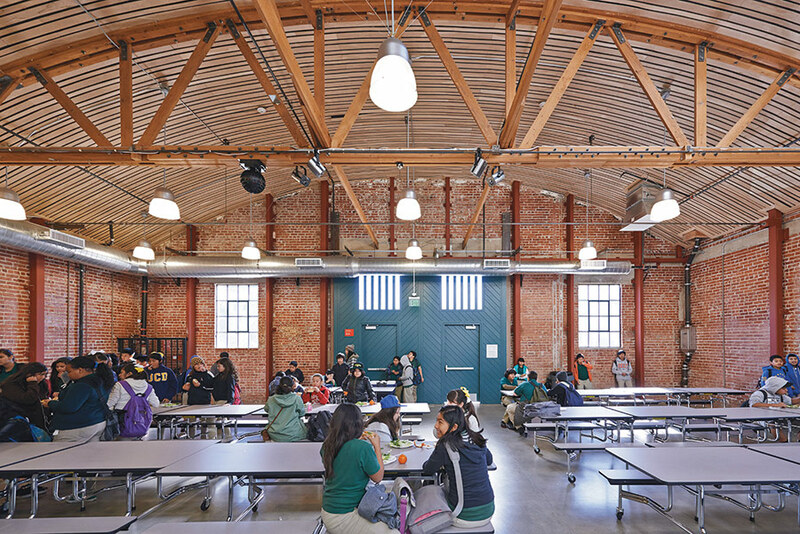 The raw interior, with its concrete floor, exposed brick walls, and bow truss roof vaults was divided with minimal white walls that enclose nine classrooms, an assembly hall, computer library, learning lab, administrative offices and service spaces. The former service yard became a playground. Seismic reinforcement was a priority, and much of the budget was invested in a structural steel frame that exceeds the usual requirements for historic structures. Roof openings bathe the interior in natural light and are supplemented by industrial light fittings. Broad corridors run around three sides and down the middle, feeding into the assembly hall, which can be separately accessed for community events after hours. Bowed wood slats conceal the insulation inside the roof vault, incorporate sprinklers, and muffle noise. Cable trays are bracketed to corridor walls for easy maintenance of the extensive wiring. Computer-filled classrooms receive indirect natural light (left). The historic Spanish facade, seen from a playing surface from the street (right). The whole job was brought in for the surprisingly low figure of $225 per square foot. But the sensitivity of FFP’s interventions lift the spirits of teachers and students. It helps that this is a solidly built historic structure with interiors far loftier than those of new-built schools. It’s already a local landmark that is well loved by the community. For Fisher, it has the same creative potential as a loft for tech startups in Santa Monica or SOMA. Found materials are accented with tones of red and green, and the whole space is a subtle play of light, shade, and varied textures. “We believe our buildings should contribute to community pride and support a collective culture of learning,” said Philip Lance, president of Pueblo Nuevo Development, and co-founder of Camino Nuevo. 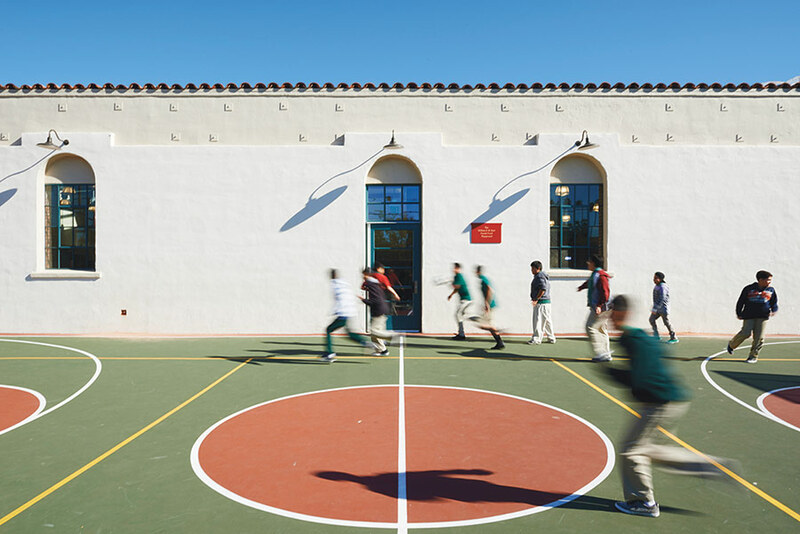 “Hiring talented design architects that embrace this philosophy is essential to a successful partnership.” In contrast to the LAUSD, a Gulliver constrained by a net of bureaucratic procedures and regulations, the charter schools encourage creative freedom for designers and teachers alike. Some have failed, but that is the price of experimentation. Walking around Jane Eisner and watching the attentive faces of its students restores one’s faith in the promise of free education.